Steve loves photography and videography, having a barrel of fun with his iPhone 6s and his GoPro Hero 3. The GoPro’s ultra wide angle lets him take selfies with a lot of people in the photo. One of his favorite photos (which has been Lindsay’s cover photo for ages) is one of his entire family, 22 of us, all in one shot. That’s really hard to get with any other kind of camera. He also gets phenomenal shots of scenery with his GoPro, often with the two of us in the close foreground. Landscape photography alone can be a bit boring and selfies alone get overdone, but a combination can be a nice change. There’s only one thing cooler than an ultra wide photo from a GoPro, and that’s the new 360 degree photos and videos you can get with specialized cameras. Before we go too far, I want to acknowledge that “360 degree” isn’t technically correct, because in reality these photos are 4π steradians. Degrees (or radians) only describe one dimension, you need 4π steradians to describe all directions at once. But for the purpose of not sounding like the nerd ball I am, I will use the conventional 360 term. Know that it bugs me every time I say it though. Alex Lindsay on MacBreak Weekly bought a 360 camera called the Ricoh Theta S and used it to take a photo of 30 of his relatives at his father’s 90th birthday party. He put the camera in the middle of the table and had everyone gather in a circle. It’s so cool! I knew that Steve would love one of these. Luckily Father’s day is coming up soon so I bought one for him early and couldn’t wait to give it to him. The Ricoh Theta S is $350 on Amazon right now, so think GoPro pricing. Let’s start by talking about the photos that you can get from the camera, then the videos, then I’ll walk you through the hardware and software. The 360 photos off of the Theta S look absolutely fantastic. At high resolution they’re 5376×2668, but they only take up 4MB of space. Good thing because the camera only has 8GB of internal memory. In the high res mode you can get around 1575 shots on the camera, and trust me, that’s about 1500 more than your friends actually want to see. But if you wanted to do a giant time lapse, you can dial it down to 2048×1024 and get over 8000 shots before you run out of room. When the internal software stitches the images from the two sensors, it actually completely removes the camera from the photo. It shows your fingers holding the camera, but they’re touching each other so you see nothing between them. Did I mention how cool the photos are??? 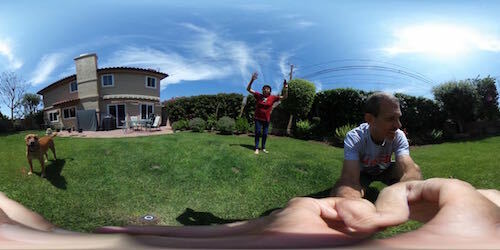 I put a link in the show notes to the first photo we took, embedded from theta360.com. Slide around in the photo, go up and down but also zoom in and out with the +/- buttons and you get some really cool views of Tesla and me playing in the back yard. The detail and color and awesomeness is everything that we hoped for. I wish I were as excited about the 360 videos from the Theta S. They’re either 1920×1080, or 1280×720. Now you’d think that 1920×1080 would be gorgeous, but remember you’re getting all of 3D space in that video. You can look straight up and straight down and all the way around you so that’s really pretty low resolution. It also took quite a while for YouTube to render even a very short video. If you check out the video in the show notes, you’ll notice that Safari won’t show you a 360 version of the video so you have to switch over to Chrome. In Chrome you can push on the screen with your cursor to move around the video while Steve is recording. Watch me chasing butterflies with Tesla. Technically you can see that there’s something flying around but the resolution is so low you’d never know that’s what they were if I hadn’t told you. It’s SUPER fun to watch on a mobile phone in the YouTube app. You can simply turn the phone around and the app recognizes the gyroscope and moves you around in the video. Freaky cool! Ok, enough about how cool the output is, let’s get into the Theta S hardware and software. 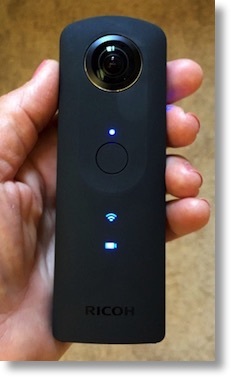 The Ricoh Theta S is 13cm long and 4.4cm wide and is covered in that wonderful, velvety coating that feels so good to hold. it weighs 125 grams, or a little over 4 ounces, so it feels solid in the hand. It has two, hemispherical lenses that stick out on either side and the internal software magically stitches the two captured images/videos into one. It’s really a sign of how powerful processors have become that the math can be done in this tiny little device. The indicator lights on the Theta S are the best I’ve ever seen. The blue indicator lights on the front look like a camera and video camera. The WiFi light is the WiFi symbol. They’re placed right below the shutter button so you’re unlikely to take a video when you meant to take a photo. On the metal side band, there are three buttons: one to toggle video to photo, one to toggle on/off the internal WiFi, and the top button is simply power. That’s it, that’s all the controls and they’re perfectly obvious. On the bottom there’s a micro USB port and an HDMI port. I’m assuming the HDMI is for live streaming but we haven’t tried that just yet. The Theta S comes with a soft case, and you’ll want to be sure to keep that nearby because setting the camera down on its side sets it right on those hemispherical lenses so to keep them scratch-free that case is essential. So hardware gets an A+. I wish I could say the same for the software. The software is beyond horrible. First of all, the desktop app is an Adobe Air application, and it automatically installs Adobe Air for you. Seriously? in 2016? The installer is super janky looking, and the instructions are clearly not written nor edited by a native English speaker. It looks worse than Windows 98. 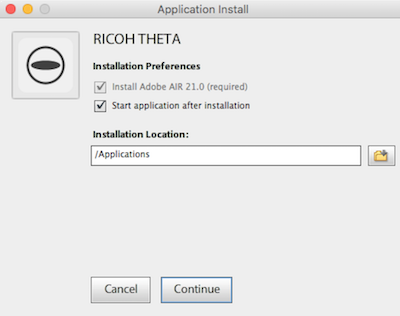 Once installed, the Rico Theta software simply says to drag images onto it. Ok…but how do I get the images from the Theta S to my Mac? Plugging the Theta S into the Mac via the included Micro USB cable does not reveal the camera on the desktop. It does launch Photos but if you import the images into Photos, the Theta software doesn’t recognize them. We dug around on the forums and discovered that you have import them using Image Capture for them to retain the correct information to become truly 360 and not a flattened version. By that I mean how a globe looks different than a flattened version of a globe. We also learned that there’s a hack to get the Finder to recognize the camera, something like holding down the WiFi and camera button at the same time while plugging in the USB cable…which means you need 3 hands to do it. Ok, the import using Image Capture works, and the images are stunning in the Theta app. As long as you can get your friends and family to crowd around your computer screen, you’re golden. But what if you want to share these images online? We had heard that Facebook supported 360 images, but how? We went online again and eventually discovered that you have to create an account at theta360.com and the login must be to either Facebook or Twitter. I connected my Facebook account and I was in. But “in” meant I had a screen showing me where my photos and videos would be if I had uploaded them. No upload button. After a lot of searching and swearing I went back to the janky Adobe Air desktop app and found in the menus a login button. Yay. I can upload photos now. It doesn’t actually upload the photo to Facebook though, it uploads to the theta360.com website and then plops a link into a Facebook update. Still really cool. Ok, we beat THAT into submission. But wait, it gets worse. Remember the story of Alex Lindsay with the camera in the middle of the table? To take a photo like that you have to trigger the camera via your smartphone. Steve and I both installed the app onto our iPhones. When you turn on the WiFi on the Theta S, you can connect to it in WiFi Settings on iOS. The password is rough – it’s typed in itty bitty tiny little letters on the bottom of the camera, and it’s a subset of the serial number of the device. When Steve launches the app on his iPhone, he sees what the camera can see and has a great deal of control for the device. When I connect MY iPhone to the Theta S’ WiFi network, the app says I’m not connected. If I say so myself, I’m pretty clever at this stuff with a fair bit of experience, and as of today I have not been able to beat the app into submission. I don’t think I’m alone, let me read you a quote from a review Pat found on Amazon, “It’s easier to reverse engineer the reactor room of a nuclear submarine than to work out a reliable efficient workflow”. So there’s that. UPDATE: Great news, I called Ricoh Tech support and my new little best friend Randy explained that there’s a Theta S app and a Theta app for iOS, and the plain Theta app doesn’t work. Switched to Theta S app and it worked immediately. Only visual cue is that the two icons are negatives of each other (black/white vs. white/black) and once in the app there’s no difference to be seen. Yay! But let’s move on and take a look at what STEVE and everyone but me can do with the Ricoh Theta S software on iOS. When in the still photo mode you can see a small panorama version of what the camera sees, or you can go full screen and push around with your finger. This view from your phone ensures that Uncle Ned isn’t covered up by Aunt Sally’s enormous hat for that family reunion photo. There’s a great deal of camera control in the app as well. In Automatic mode, you can apply exposure compensation, stopping up and down, and you can also compensate for challenging lighting situations. You can choose between noise reduction, High Dynamic Range, and Dynamic Range compensation. I have no idea what the difference is between the last two, other than the fact that they suggest you hold the camera still during HDR. I know HDR takes multiple images to capture both shadows and highlights but DR Compensation is a mystery to me. If you want to get more creative, you can jump over to shutter priority with shutter speeds from 1/8 to 1/6400 of a sec. In this mode you an adjust your white balance and do exposure compensation. There isn’t an aperture priority mode, but there is an ISO priority mode with a range from 100 to 1600, plus white balance and EV controls. If you’re an animal like Antonio Rosario, you can go into full manual control, setting shutter speed, ISO and white balance. You can set up interval shooting so you could create a time lapse pretty easily with full control over the interval time and total number of shots. Pretty cool hat you get this much control. If the app works of course. I always like to give a bottom line on my reviews but this one is tough. Fantastic hardware design, awesome still photos, but if you care about video resolution you’ll be disappointed. From our extensive data set, I can tell you that you have a 50% probability of being able to run the iOS software to control the camera, but maybe you’ll have a higher success rate with Android. I hope that I come back next week with one of those, “I am SUCH a moron” stories where I figure out what I was doing wrong and tell you that Ricoh was unjustly accused. 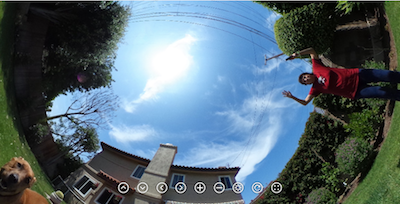 360 photography is definitely in its infancy so we’re in early adopter territory. If you’ve got $350 and you want to get in on the new hotness, check out the Ricoh Theta S at theta360.com or use the Amazon Affiliate Links in the shownotes to buy one yourself. UPDATE: I called Ricoh tech support and it turns out they have TWO apps in the App Store. One is called Theta, and the other is called Theta S. When you’re inside the two apps, they look identical, which explains why I didn’t realize it was the wrong app. The Theta app does not work with the Theta S! The two icons are the same too, but one is black and white, the other is white and black. As soon as I opened the Theta S app on my iPhone, the camera worked brilliantly! So I’m not going to call myself a moron but I can now declare the Theta S as a fabulous camera. I called tech support at Ricoh today and as soon as the guy got on the phone with me, the app started working on my iPhone. So that’s helpful. I would really have preferred we’d found a root cause so I would know how to prevent the problem! I too suffer from the Ricoh Theta S iOS connectivity problem!!!!!! I just bought the device Nov 2016 and I cannot connect it to the Theta S app from my iPhone 6s Plus. What gives? I tried everything. Kenny – in the end we figured out there are two different iOS apps. Once we got the RIGHT one we have had no connectivity problems. GOOD NEWS! It works now!! I visited the app store iOS and downloaded the Chinese or Japanese version of the app as well as the English Version and it worked in the Foreign version at first but then I launched the English version and it worked! I have been messing with it all week and now finally after removing the Theta S app several times and reinstalling it, it finally works! I checked the update log in the app store and they haven’t released a new update so it must just be a buggy app! Advice for people with my same issue, just install the Theta S app if you bought a Theta S and then install the app, try it, if it doesn’t work, delete the app, then delete the app, delete the app, delete the app, reinstall the Chinese version and English version at the same time then remove the Chinese version and it will work for you! I tell him it’s a 360° camera and show him one of my Google Street View pictures.